A Red Kite, a large raptor about the size of a buzzard, with a forked tail, was seen recently over Alderley House , Copper Mill Close, by Elissa Bailey. At one time Red Kites were common across the whole country, even in London, but following persecution by gamekeepers were eliminated from England and were down to the last few pairs in Mid-Wales in the 1960s. Conservation intervention and a more enlightened community has slowly allowed the species to recover and spread out from Wales. Additional birds were released in various places in the country that are spreading out, resulting in occasional sightings in the Whiston area. Red Kites feed mainly on carrion and do not present a significant threat to other wildlife. They are a magnificent sight when seen floating over the countryside with their jinking flight, controlled by their twitching forked tail rudder. An unidentified bird has been seen in Kingsley on 01 March. A photograph was taken from a distance and does not allow identification of the species. Has anyone else seen it and taken a better picture? It was around the size of a blackbird maybe, but definitely bigger than sparrow size. 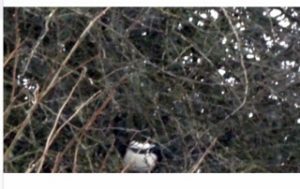 It’s looking towards the camera and has a black band under the beak area on what appears to be a black and white body.